In preference to focusing on how Yemen is failing, this is an attempt to flip the script on traditional methods of reporting. To gaze at the Yemen crisis, and contemplate a possible solution based on what has worked in other countries. Yemen is a country fractured by geographical, cultural, class and religious differences. Religion is being used to gain political advantage as it is in Iraq, Syria and Egypt. In addition to this former president Ali Abdullah Saleh and his allies from the Islah party (Muslim Brotherhood) are supporting extremist groups, making things more problematic. There are two stages to achieving a solution to satisfy/appease the warring factions. Stage one is deal with the main area of contention. The union of North and South Yemen is as doomed as the powerful Soviet Union was. The break up of the USSR happened overnight and the results satisfied most people in the countries that found independence. 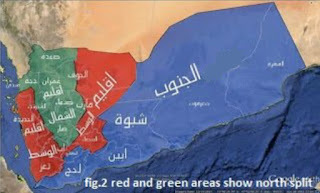 There is evidence that the Yemen Civil War 2015 could have been avoided had north and south been separate states. North Yemen was taken by coup forces without a fight. When they invaded South Yemen on 19th March 2015, it was not so easy, coup forces found themselves at war with…the natives who formed the Southern Resistance. Therefore a clean break reverting back to the pre-1990 borders is a perfect solution and goes without saying. There has been limited and informal discussion on what is the best solution for North Yemen’s divide. Like some Asian counterparts, North Yemen has carried a class system for centuries. Within the class system they are also divided religiously, meaning the rich tend to be of Shite following whereas the poor are Sunni. Upper Yemen (Sanaa) reigns over lower Yemen (Taiz and Ibb and the likes) see fig.1. These divisions create tensions between the two communities, which in the past has led to conflicts such as the wars of the 60s and 70s. Combine this with attempts by Iran to sponsor Shite Islam in the upper north to take control of Yemen, in order to control the entire belt around the gulf. This supports the idea that a separation between the two is necessary to ensure no further bloodshed ensues. In order to find a just solution for North Yemen, we need to compare the current situation to an event in history, in which a solution was found in similar circumstances. Here tensions were caused due to oppression on the basis of class and religion, much like the situation at hand. North Yemen having an oppressive class system and religious ideology imposed, where upper Yemen reigns over lower, fused with Iran poking its nose. This fits hand-in-glove with India pre-separation, having had a similar class system and different religious ideologies, and the British Empire trying to keep its foot in the door. In this case the viceroy decided that the partition of India, and creation of Pakistan, which gave people more control and autonomy, and was the only solution after interested parties couldn't agree. Following the split the countries have had their ups and downs, but now enjoy good stature. 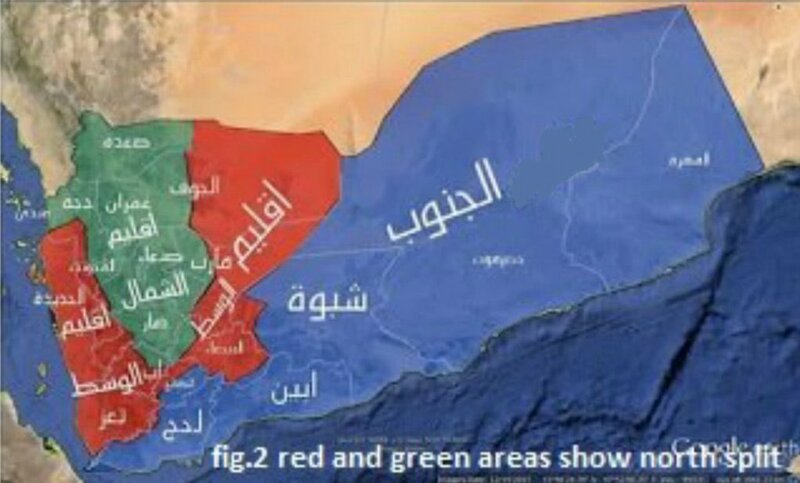 North Yemen's split red & green areas in fig.2 will ensure equality and stability in the region. Like India, Yemen may find their president (viceroy) is only one that can make this decision. Separation is the only way to achieve balance.